The solubility of this compound in DMSO is >20 mg/mL. General tips for obtaining a higher concentration: Please warm the tube at 37 ℃ for 10 minutes and/or shake it in the ultrasonic bath for a while. Stock solution can be stored below -20℃ for several months. CVT-313 inhibited cdk2 in several human DLBCL cells. Incubation of DLBCL cells with 25 μM CVT-313 reduced phosphorylation of endogenous Rb on Thr821. CVT-313 (48 and 72 hr) induced cell apoptosis in human DLBCL cells in a time-dependent manner. CVT-313 treatment did not result in cell cycle arrest at 20 hr or at 48 hr. Treatment of LY3, LY8 cells and LY18 cells with CVT-313 led to parallel changes in XIAP and Mcl-1 mRNA levels. 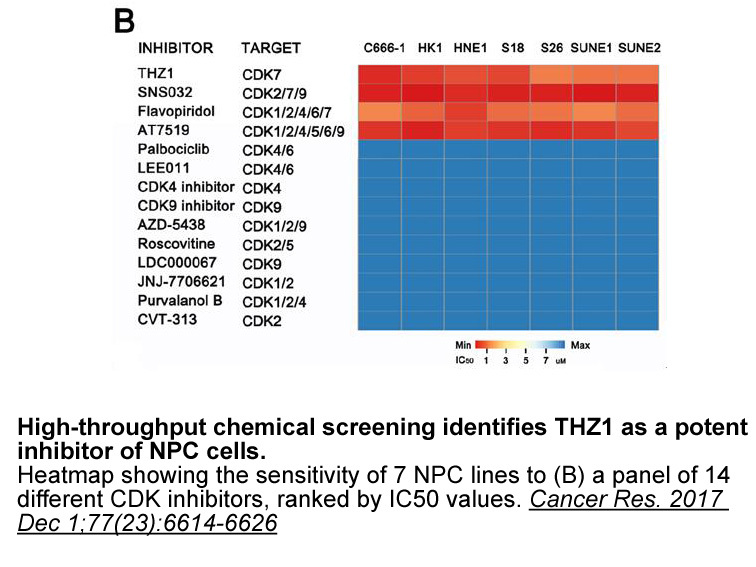 In normal and tumor human/murine cell lines, CVT-313 inhibited cell proliferation with the IC50 ranged from 1.25 to 20 μM. CVT-313 (12.5 μM, 18 h) induced cell arrest at the G1/S and G2/M boundary. In nonsynchronized MRC-5 cells, treatment with CVT-313 (6.25 μM) for 36 h induced a 2 N DNA content. Treatment with CVT-313 (6.25 μM) for 4 or 8 h after serum stimulation inhibited Rb hyperphosphorylation. In the injured rat carotid artery model of restenosis, lower doses of CVT-313 (0.75 and 0.25 mg/kg) were less efficacious, reducing mean neointimal area by about 30%, whereas the lowest dose tested (0.025 mg/kg) did not achieve any significant reduction in neointimal area. Treatment with CVT-313 for 14 days blocked restenosis in the rat carotid model.
. Faber A C, Chiles T C. Inhibition of cyclin-dependent kinase-2 induces apoptosis in human diffuse large B-cell lymphomas[J]. Cell Cycle, 2007, 6(23): 2982-2989.
. Brooks E E, Gray N S, Joly A, et al. CVT-313, a specific and potent inhibitor of CDK2 that prevents neointimal proliferation[J]. Journal of Biological Chemistry, 1997, 272(46): 29207-29211. CVT-313 is a potent inhibitor of cyclin-dependent kinase 2 (CDK2) with IC50 value of 0.5 μM . CDK2 is a serine/threonine kinase that is essential for the G1-S phase during cell division. CDK2 is an important target for prevention of aberrant cell proliferation . In MRC-5 cells, CVT-313 inhibited Rb hyperphosphorylation in a time-dependant way and the cell cycle was arrested at the G1/S phase. Also, CVT-313 inhibited the growth of mouse, rat and human cells with IC50 values from 1.25 to 20 mM . In human diffuse large B-cell lymphoma (DLBCL) cells, CVT-313 reduced CDK2-mediated phosphorylation of the retinoblastoma gene product (Rb) on T821. Also, CVT-313 reduced the anti-apoptotic factor Myeloid cell leukemia-1 (Mcl-1) and induced apoptosis . In the injured rat carotid artery model of restenosis, CVT-313 (1.25 mg/kg) reduced neointima formation by 80%. Moreover, Treatment animals with CVT-313, the neointimal areas were inhibited by at least 70%. These suggested that CDK2 was an antiproliferative target and CVT-313 is an ideal candidate for the treatment of proliferative diseases .
. Brooks EE, Gray NS, Joly A, et al. 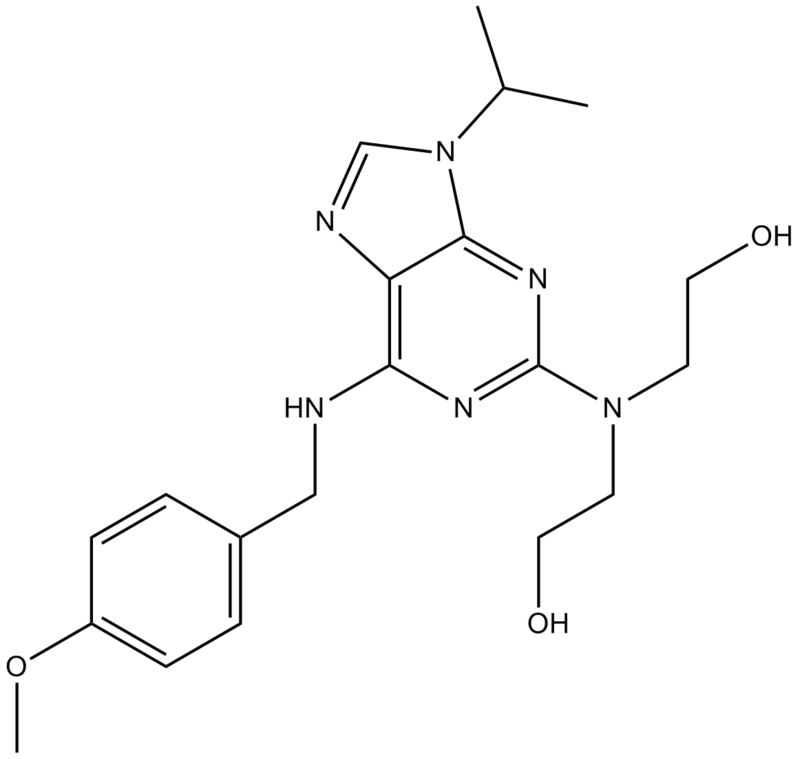 CVT-313, a specific and potent inhibitor of CDK2 that prevents neointimal proliferation. J Biol Chem, 1997, 272(46): 29207-29211.
. Faber AC, Chiles TC. Inhibition of cyclin-dependent kinase-2 induces apoptosis in human diffuse large B-cell lymphomas. Cell Cycle, 2007, 6(23): 2982-2989.